Update: Oink has been shut down. There is a press release statement on the oink website along with an option to extract your Oink content. The founders have decided to close Oink and move onto other projects. You can read the full statement and enter your email address to Download your Oink content at the Oink website http://www.oink.com. 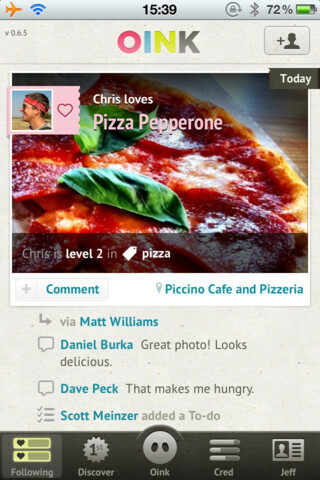 Oink is the latest iPhone app from tech guru Kevin Rose and the Milk Inc. development team. It’s currently available at Apple’s App store for the iPhone, iPod Touch , and iPad for free. Oink aims at taking the Foursquare concept of”checking in” to a location that they visit, such as a restaurant, to the next level of connectivity. 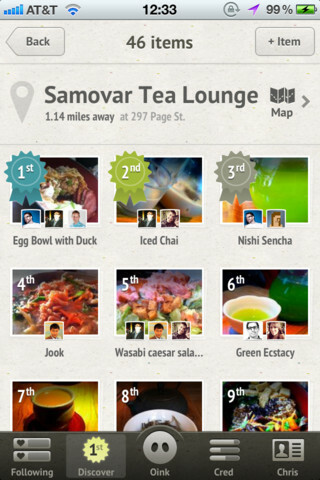 Rather than sharing places, Oink wants you to rate products you enjoy, and share where you can get them. This lets users include more nebulous products that have no particular location, such as a band. The real genius here is that it will let you include a place to find that item, whether it be a website, or perhaps tie it to a local record store you like to share with others as well. All of this is tied together by integrating with Twitter and Facebook, in addition to manually adding other Oink users. You can opt out of tying into social media, though this will take away from the experience. It lets users follow and be followed ala Twitter, and it all appears in a feed on your screen. It also makes use of keyword tags to organize all posts in the system. The application is easy to use, especially for anyone already familiar with social media. It’s best described as what would happen if Facebook and Twitter had a baby, but was adopted out and raised by Google Maps and Yelp. It has all the connective social aspects users have come to expect, allowing them to see what their friends are in to, but also what’s trending nearby. To find a great slice of pizza in city you’ve never been to, for instance, simply bring up the map and you’ll get relevant suggestions, making Oink especially useful as an iPhone app . One unique concept to Oink is the concept of “cred”, from the street slang for credentials. Essentially, the more you “oink”, or share reviews, the more cred you receive, making your voice more important in the crowd. Your cred is tied to chosen subjects, such as tech or food, and increases with each item you review under that tag. This really does motivate the user to keep oinking, as well as providing ratings that will let you discover new people to follow. Overall, this Oink does a great job of tying together many other user generated content sites like Yelp and Foursquare in a way that not only lets you share amongst friends, but also lets you discover hidden gems in the city around you. The software itself is fast, responsive, and intuitive with an interface that blends nicely with the whole iOS experience. The one issue with the service at the moment is that in larger areas is sometimes struggles to keep up with the input it’s receiving, resulting in occasional crashes and services gone wonky, but this is most likely an issue that will be ironed out in the months to come as they make enough money to expand their number of dedicated servers. However, as Oink is free this is a minor blemish. Oink may not be a good choice for people living in small communities, since it is dependent on user feedback to generate results, but for everyone else, it is definitely at least a “must try”. AppSafari review of Oink was written by Joe Seifi on November 11th, 2011 and categorized under App Store, Food, Free, Local, Social, Travel. Page viewed 5565 times, 1 so far today. Need help on using these apps? Please read the Help Page. With the discontinuation on Oink and the duress that’s caused, we offer a little solution to make the world a little less bleak for loyal Oinkers. With a simple, one step Oink-to-Taap Import Tool located at http://taap.it/import-oink, former Oinkers can convert their painstakingly accrued “Oinks” into “Taaps”. In such, participants can then use their new “Taaps” to unlock local deals and earn rewards in weekly contests.